DSEI (Defence & Security Equipment International) is the world’s largest arms fair. It allows arms buyers and sellers to network and make deals. It happens once every two years, in the second week in September, at ExCeL – the huge exhibition centre in London Docklands. 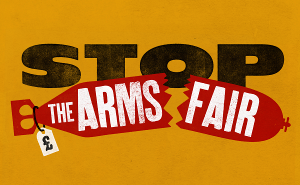 Can we actually stop the arms fair? It may sound like a pretty big ask: shutting down a heavily policed, multi-million pound arms fair. Where is the ExCeL centre? The ExCeL centre is hidden away in London’s docklands. Tube: nearby stations include Royal Victoria, Custom House, and Prince Regent on the Docklands Light Railway (DLR). On the Jubilee line and DLR, slightly further away, is Canning Town. Car: Follow signs for Royal Docks, City Airport and ExCeL (postcode E16 1XL). If you’re from outside London: the TFL website explains how to get around London. If you want to share transport, or you have spaces to offer, then see our transport page. For more transport information, see ExCeL’s website. They also have an interactive map so you can get a sense of what it looks like inside. What’s happened at DSEI previously? Read our history of the DSEI arms fair.